WYSA and MKSC have a ZERO TOLERANCE POLICY for all players and adults. 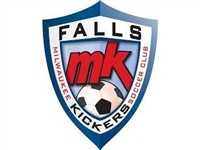 Milwaukee Kickers is hosting the annual Kohl's Fall Rec tournament the weekend of October 12th - 14th at Uihlein Soccer Park. U7-U14 boys/coed and girls rec teams are encouraged to participate. Youth Academy teams are also welcome to play in the event. NO recreational level league games at these age levels are scheduled on these dates to allow teams to register for the tournament without additional soccer conflicts. CLICK HERE to obtain more details on the tournament and a registration link. The last day to register a team for the tournament is September 26th. Coaches and Managers: To reschedule an outdoor game, please contact Chris McCormick (ChrisM@mksc.org) for game day options. U7-U14 coed and girls rec teams have a 9th game scheduled. This is an additional game played INDOOR at Uihlein and is listed on a separate schedule. Under 06 Coed Blue DivisionFairy Chasm Jr.